Why is pot still illegal in 2007? Could it have something to do with the CIA’s sordid history? David Monson is a North Dakota state legislator who’s been trying to get permission to grow hemp for about 10 years. He may finally be getting close, but first he must go through an onerous set of flaming hoops set up by the DEA. Last month, the state Agriculture Department finished its work on rules farmers may use to grow industrial hemp, a cousin of marijuana that does not have the drug’s hallucinogenic properties. The sturdy, fibrous plant is used to make an assortment of products, ranging from paper, rope and lotions to car panels, carpet backing and animal bedding. Applicants must provide latitude and longitude coordinates for their proposed hemp fields, furnish fingerprints and pay at least $202 in fees, including $37 to cover the cost of criminal record checks. Johnson said the federal Drug Enforcement Administration still must give its permission before Monson, or anyone else, may grow industrial hemp. “That is going to be a major hurdle,” Johnson said. Yeah, the DEA are basically a bunch of assholes when it comes to common sense and hemp. They won’t give permission unless they feel cornered. Keep the pressure on; some more media coverage would be nice. 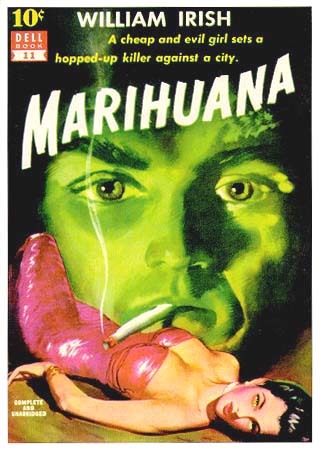 But all this obscures the larger and more potent question: Why is “marihuana” still illegal? Certainly industrial hemp should be legal since it has none of recreational ganja’s psychoactive properties. But why is cannabis in general illegal? Most people would agree that Prohibition was a titanic failure. But we’re still stuck with many of the after-effects of the prohibition mentality, including the idiotic, wasteful, racist and anti-freedom War on Drugs. The War on Drugs is a total failure and a fraud and even many former cops and DEA agents will testify to that fact. An excellent article called Why Is Marijuana Illegal? tackles that very issue, with some surprising revelations… Or not-so-surprising. I guess it depends on how jaded you are when it comes to politics and business. But racism may have been the weapon that was used most effectively against hemp and cannabis. Harry J. Anslinger (who looks like a gangster/mafioso to me) led the charge against “marihuana” (the word itself is a propaganda invention designed to draw up racial fears). 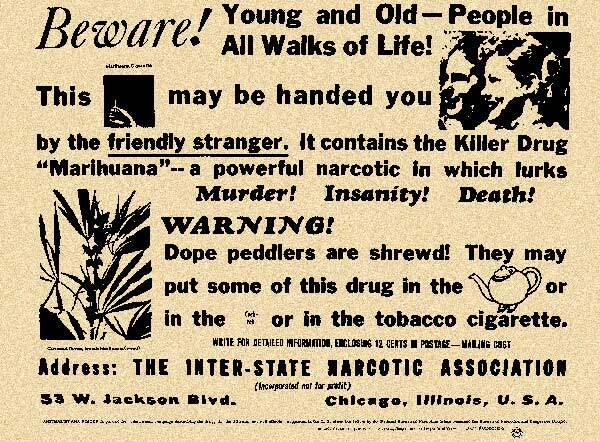 There were a lot of lies said about pot back in the day. But it’s 2007 and we know better, so why is it still illegal? I mean, people don’t seriously believe that pot causes “insanity, criminality and death” — everyone knows it only causes the munchies and drymouth. But we still allow the government to lie to us every year and keep spending millions of dollars to send inner city youth to jail for with harsh mandatory minimum sentences? 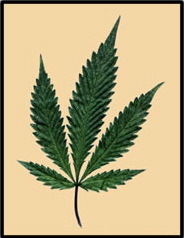 Pete Guither’s article does a great job of explaining how cannabis first became illegal, but it does not really tell us why it’s still illegal 70 years after the Marijuana Stamp Act. On October 31, 1996, the Washington Post ran a follow up story to the San Jose Mercury News series titled “CIA, Contras and Drugs: Questions on Links Linger.” The story drew on court testimony in 1990 of Fabio Ernesto Carrasco, a pilot for a major Columbian drug smuggler named George Morales. As a witness in a drug trial, Carrasco testified that in 1984 and 1985, he piloted planes loaded with weapons for contras operating in Costa Rica. The weapons were offloaded, and then drugs stored in military bags were put on the planes which flew to the United States. “I participated in two [flights] which involved weapons and cocaine at the same time,” he told the court. Funny how the news doesn’t do investigative reports on stuff you might actually want to know. The press could have found a lot more dirt on this scandal, but they steered clear after a limited hang-out. That’s because the whole system is set up to demonize drugs so that they will be so much more profitable. Legalization would utterly destroy the CIA’s little “fundraising” operation and it would effectively end the careers of many DEA agents, who’ve become like a parasitic wasp, sucking at our nations’ failed and painful drug policy. It’s time to end the lies, the racism and the idiocy of the War on Drugs and declare peace. It needs to end, and there needs to be an investigation. Those who profited from the war by playing both sides should be punished according to their own rules. The video above is Dealing with the Demon, an excellent look into the CIA’s activities in Afghanistan during the war against the Soviets. Perhaps we should not be surprised that Afghan poppy production has exploded since we “liberated” it from the Taliban. How… interesting. Updated on 1-16-07 with new links, a video and various spelling-error fixes. funny. 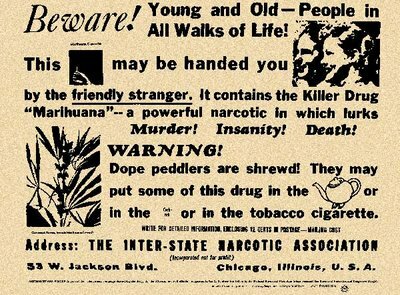 no one’s ever just randomly offered me a marijuana cigarette like that poster warns. i must be doing something wrong …. yeah, you better work on that. this propaganda is only hurting their cause. That dime-store novel looks pretty good, and that tagline is classic: “a cheap and evil gril sets a hopped-up killer against a city.” Nice. I like how they mention that she’s “cheap.” Does this mean she’s a prostitute or a miser? So many questions, I must read it! legalize it, time to recognize it! Not many things make me mad. But damnit! Legalize the bloody hemp before I kill ya! I’m not sure that the government will ever legalize marijuana. Think about it. There is no way (at least at this time) to detect how much marijuana that you had to smoke today. If you have a few drinks, a breathalizer test can be administed or a blood test and you can get a reading of how much alcohol is in your system. Thus, a police officer can determine if you are over the legal limit. With marijuana, you can test positive for it but they cannot tell if you smoked it today or a week ago. For this one reason, I don’t think that the legalization marijuana will happen any time soon. legalize the danm thing ho! I’m very torn on the issue. But I agree with Anonymous on July 30, 2007. If you want to legalize marijuana, someone needs to invent a device to detect current levels in your system so that individuals are not driving under severe influence. This will eliminate at least one (if not the most prevalent) argument as to why marijuana is illegal. Using pot irresponsibly should be regulated the same as alcohol. But a Federal ban against everyone who does use the drug responsibly is wrong. I’ve smoked for years and I’m a productive, functional member of society. If I went to jail for smoking I would no longer pay taxes and more of your tax money would go into the court & correctional systems. And when I got out of prison after a harsh mandatory minimum do you think I’d be a better citizen after hanging out with murderers and rapists for the past 3 years? No one gets high and beats their wife. No one gets high and passes out in a gutter. People get high and eat too much and annoy their friends who are not high. Just don’t get high when you have something important to do and don’t get high everyday or you’ll become a douchebag hippie. There’s no reason for the government to punish you any further. Being a douchebag hippie should be punishment enough.